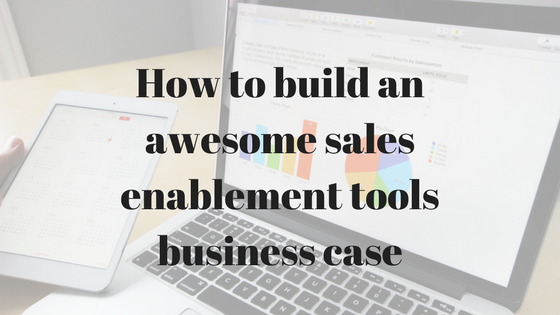 Are you considering creating a sales enablement tools business case? This blog post will show you how I created justification for an enterprise class deployment (4500 users) of sales enablement tools. Any business case requires you to justify the expenditure on something, in this case a sales enablement tools business case. There are generally two ways to show this justification, a reduction in cost or an increase in revenue. For this example, I focused on an increase in revenue but you very well could justify it with a reduction in cost. Most notably, less time sales reps spent looking for content and doing administrative overhead. How do Sales Enablement Tools Increase Revenue? Sales enablement tools offer a variety of benefits for a B2B selling organization that can help increase revenue. More Efficient Selling – Any time spent doing anything other than selling is going to hurt a sales reps pipeline. Sales reps spend only a third of their time selling. If they aren’t out prospecting or closing business, they aren’t maximizing the use of their time. By using sales enablement tools, you enable sales reps to be more efficient. They spend less time looking for content. And their interactions with customers are streamlined, oh and ideally their interactions with customers are more efficient. This is core to my sales enablement tools business case. More Effective Selling – Not only do sales enablement tools make sales reps more efficient, but they also make them more effective. Sales enablement tools enable you to put the selling cycle more on rails, and to make sure sales reps are using the most effective piece of content for each touch. I then looked at two metrics: number of opportunities per rep and pipeline dollars per rep. The program was less than a year old when I started this, and since our sales cycle was close to a year, I felt it best not to look at revenue metrics. What we noticed was that those who used the tool the most, had the most opportunities – 23% more opportunities than those that didn’t use the tool (see graphic). For pipeline per rep, it was also compelling with all groups using Sales Enablement Tools; showing 10-20% more pipeline dollars than those who didn’t use the tool. Interestingly, we actually saw some regional variation. We rolled the program out to Europe and North America, and Europe saw more compelling numbers than North America. When I discussed this with my contacts in EMEA, they mentioned that tablet based selling was HOT HOT HOT in continental Europe and that would account for the difference. This justification was enough to expand our usage from 1,000 pilot users (it actually crept up to 1,200 based on user demand) to 4,500 users and an enterprise global deployment. Every field sales rep, across the globe, for four product lines was provided an ipad and a license to use the tool. It was also enough justification to get sales enablement tool training included in all of our global kickoffs. Considering how packed that agenda was, I felt like it was a huge win. It was fun to travel around the world and teach sales reps how to use an ipad and effectively change the way they present. You can read some tips about what I learned here. I did realize that my justification might have been a bit too complex though, as it was difficult to explain the differences in the groups to senior executives, and in the end my lines were arbitrary on tool usage. I knew I would need to refine this for the next go around. Like many martech projects, there is continual justification required. So when the sales enablement service came up for renewal, we were asked to again provide justification. Having done this once, it was a tad easier to complete the same justification. I looked at more metrics this time (based on executive feedback) along with simplifying the groups of users. This time, we drew the line at average users and then compared below average tool users with above average tool users. I felt this distinction would enable easier digestion from our management, plus after the expansion most reps were using the tool so non tool users didn’t exactly work. We also included our sales reps satisfaction and quotes on usage in our presentation, to give the end user representation. I will write a blog post on what we heard from users, but it’s important to gauge their views on sales programs, I wrote about that here. Overall I felt this justification was pretty compelling. Obviously our execs agreed as we did get a renewal for a year. The year will be coming to an end, so I expect another sales enablement tools business case to be requested yet again. Oh, one other thing we discovered in this justification research which was not included was that the reps that closed the most deals used sales enablement tools the most. There was a direct linear relationship– more content usage resulted in more deals closed. Our executive management team in every analysis quickly pointed one thing out. How do you know the tool resulted in improved usage? Might it be that better reps use the tools available. And the answer to that is that we just don’t know. However, the differences were so compelling that it’s probably worth taking the risk and encouraging tool usage. Start measuring at the beginning. It would have been much easier to show the impact of the tool if I benchmarked performance prior to the tool rollout. This recognition was so big to me that I wrote a blog post about it. Continuous Monitoring. Several of our sales enablement tools business cases became rush exercises as we were unprepared for an executive update. The updates we scheduled and prepared for weren’t an issue. But when asked to rapidly turn around justification at odd intervals, we often scrambled to complete. We learned to keep relatively up-to-date metrics on file to share when asked. Controlling for Rep Turnover. The reality is that most B2B sales organizations have high rep turnover, and our organization is no different. It would have been best to include only reps that had been with the organization for a year in the analysis, as in some orgs I saw rep attrition at 30%. It sells a tool short to measure performance without letting a rep complete onboarding process, and give them time to complete a few sales. Simplification. It’s easy to be too into your project that you provide details and distinctions that are largely irrelevant for anyone but you. It’s best to simplify the sales enablement tools business case into simple terms and groupings. This way you don’t have to define things as you go. I really enjoyed rolling out and making this sales enablement program a success. If you would like to discuss this sales enablement tools business case with me further – I would love to hear from you. Contact me via comments, twitter, or our contact page. Pingback: How do you convince reps to adopt sales enablement tooling?